Everyday, we depend on many systems and machines. We use a car to travel, a lift go up and down, and a plane to fly. Electricity comes through turbines and in a hospital machine keeps us alive. These systems can fail. Some failures are an just an inconvenience, while others could mean life or death. When stakes are high, we perform regular maintenance on our systems. For example, cars are serviced once every few months and aircrafts are serviced daily. However, as we will discuss in detail later in this article, these approaches result in resource wastage. Predictive maintenance predicts failure, and the actions could include corrective actions, the replacement of system, or even planned failure. This can lead to major cost savings, higher predictability, and the increased availability of the systems. Avoid or minimize the downtimes. This will avoid an unhappy customer, save money, and sometimes save lives. Optimize the periodic maintenance operations. To understand the dynamics, let’s consider a taxi company. If a taxi breaks down, the company needs to pacify an unhappy customer, send a replacement, and both the taxi and driver will be out of service while in repair. The cost of failure is much higher than its apparent cost. One way to deal with this problem is to be pessimistic and replace fallible components well before failures. For example, regular maintenance operations, such as changing engine oil or replacing tires, handle this. Although regular maintenance is better than failures, we will end up doing the maintenance before it’s needed. Hence, it is not an optimal solution. For example, changing the oil of a vehicle for every 3000 miles might not use oil effectively. If we can predict failures better, the the taxi can go few hundred miles without replacing oil. Predictive maintenance avoids both the extremes and maximizes the use of its resources. Predictive maintenance will detect the anomalies and failure patterns and provide early warnings. These warnings can enable efficient maintenance of those components. In this article we will explore how we can build a machine learning model to do predictive maintenance. The next section discusses machine learning techniques, while the following discusses a NASA data set that we will use as an example. Sections four and five discuss how to train the machine learning model. The Section "Running the Model with WSO2 CEP" covers how to use the model with real world data streams. To do predictive maintenance, first we add sensors to the system that will monitor and collect data about its operations. Data for predictive maintenance is time series data. Data includes a timestamp, a set of sensor readings collected at the same time as timestamps, and device identifiers. The goal of predictive maintenance is to predict at the time "t", using the data up to that time, whether the equipment will fail in the near future. Classification approach - predicts whether there is a possibility of failure in next n-steps. Regression approach - predicts how much time is left before the next failure. We call this Remaining Useful Life (RUL). The former approach only provides a boolean answer, but can provide greater accuracy with less data. The latter needs more data although it provides more information about when the failure will happen. We will explore both of these approaches using the NASA engine failure dataset. Turbofan engine is a modern gas turbine engine used by the NASA space exploration agency. NASA has created the following data set to predict the failures of Turbofan engines over time. The data set is available at PCoE Datasets. The data set includes time series for each engine. All engines are of the same type, but each engine starts with different degrees of initial wear and variations in the manufacturing process, which is unknown to the user. There are three optional settings that can be used to change the performance of each machine. Each engine has 21 sensors collecting different measurements related to the engine state at runtime. Collected data is contaminated with sensor noise. Over time, each engine develops a fault, which can be seen though sensor readings. The time series ends some time before the failure. Data includes unit( engine) number, time stamps, three settings, and readings for 21 sensors. The following Figure 1 and 2 show the subset of the data. The objective of this experiment is to predict when the next failure will occur. While predicting RUL, the goal is to reduce the error between the actual RUL and the predicted RUL. We will use Root Mean Squared Error since it penalizes large errors severely, which will force the algorithm to forecast RUL as close as possible. Phase 1: The following pipeline depicts the prediction process. As the first step to get a high level understanding about what’s possible, we ran the pipeline with only highlighted steps. This runs the algorithm on raw data without any feature engineering. The following figure 3 shows the Predictive Maintenance Pipeline for Model Selection. Here, only dark colored steps of the pipelines are used. 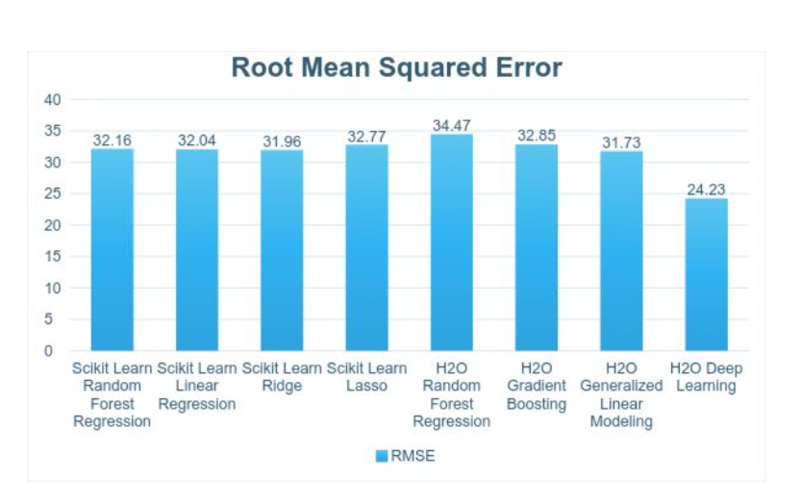 We have used a wide range of regression algorithms available from scikit learn and H2O. For deep learning, we have used H2O Deep-Learning algorithm, which can be used in both classification and regression applications. It’s based on multi layered feed forward neural network that is trained with stochastic gradient descent using back-propagation. The following Figure 4 shows the results. Models could produce RMSE about 25-35, which means that the RUL will have an error of about 25-35 time steps. For the next steps, we will focus on the deep learning model. The following figure 5 shows the Predictive Maintenance Pipeline with Noise Removal. Here, only dark colored steps of the pipelines are used. Often, sensor readings have noise. The ReadMe file included with the distribution confirms this. Therefore, we removed noise using autoencoders. Autoencoder is a simple neural network trained with the same dataset as both the input and output of the network, where the network has fewer parameters than the dimensions in the data set. This works very similarly to the Principal Component Analysis (PCA) (http://setosa.io/ev/principal-component-analysis/ ) where data is represented in terms of its principal dimensions. Since noise has much higher dimensions than regular data; this process reduces the noise. We used H2O Auto-encoder with three hidden layers and the following criteria to remove noise. Removing noise improved the RMSE by 2. The following figure 6 shows the Predictive Maintenance Pipeline with Feature engineering. Here, only dark colored steps of the pipelines are used. In this step, we tried many features and kept the subset of features that are most predictive. Our dataset is a time-series dataset, hence readings are auto-correlated. Therefore, it’s likely that prediction at time "t" is affected by some time window before "t". Most features we used are based on these time windows. As discussed in section 3, the data set includes 21 sensors readings. We can find more details about readings from the ReadMe file provided with the data set. After tests, we only used data from sensors 2, 3, 4, 6, 7, 8, 9, 11, 12, 13, 14, 15, 17, 20, and 21. For each sensor selected we generate features by applying moving standard deviation (Window of size 5), moving k-closest average (Window of size 5), and probability distribution with a window of size (Window of size 10). Among other features that we tried but did not used in the final solution are: moving average, autocorrelation, histogram, moving entropy, and moving weighted average. These features improved the RMSE by one. The following figure 7 shows the Predictive Maintenance Pipeline with Hyperparameters Optimizations. Here only dark colored steps of the pipelines are used. Hyper parameters control the behaviour of the algorithm. At the final stage, we optimized the following hyper parameters epochs, distribution, activation, and hidden layer size. You can find a detailed description of each parameter from H20 Documentation. We used a grid search to find the best parameters, and the following table summarizes the results. As the results depict, hyper parameter tuning improves the RMSE by about three. 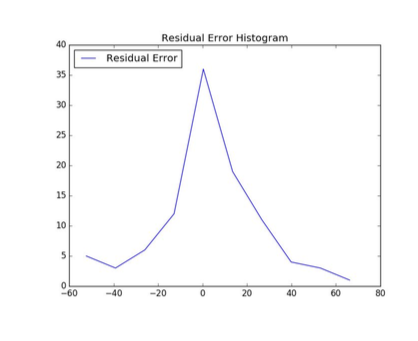 In the residual error histogram, you can see that the error is converging to "0". The frequencies of too early predictions and too late predictions are minimized. In this method, instead of providing the number of life cycles that remain, we are going to predict whether a machine will fail within the next 30 cycles. We will consider a failure as positive (P) and no failure as normal (N). We ran a deep learning classification model using the same feature engineering and noise removal process. Figure 9 depicts the results. The accuracy describes what fraction of test cases are correctly predicted. It gives a ratio of the number of truly predicted test cases to all the test cases. Only considering accuracy can be misleading if the classes are not balanced. Class imbalance happens when the same classes are over-represented in the data set. With class imbalance, some models might have high accuracy but poor prediction performance. To avoid this problem, we use precision and recall. Recall is the ratio between the number of positive values that have predicted and the number of positive values that should be predicted. Precision is defined as the model's ability to predict positive values. It provides a ratio between the number of truly predicted positive values and the number of all predicted positive values that exist. F1 score is a measure of the accuracy of the test. It takes both precision and recall to calculate the score. For accuracy, recall, precision and F1 score, it’s better to have their values close to 1. We built models in batch mode where we processed data stored in a disk. However, to apply a model, we need to feed data into a model at the runtime as the data becomes available. We refer to the processing of data as it comes in as "Stream processing". 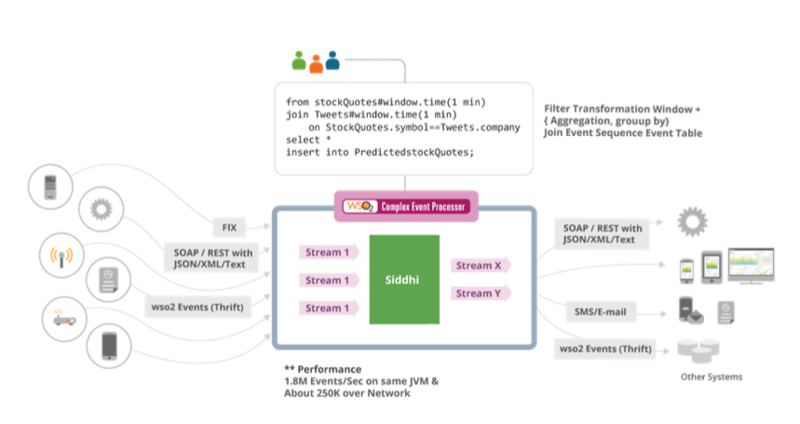 We used stream processing engine WSO2 CEP to apply the model. We built the model using H20. H2o can export the model in one of the two formats: POJO (Plain Old Java Object) or MOJO (Model Object, Optimized). The former needs to be compiled and the latter can be used directly. We used MOJO model from CEP. To evaluate the model, we used an extension in WSO2 CEP. WSO2 processes data that comes in a data stream using an SQL like query language. As shown in the Figure 10, a Complex Event Processing system receives data as event streams and evaluates them against a set of SQL like queries. For example, a given query can calculate a one minute window over stockQuotes stream and join it with a one minute window over Tweets stream on a given condition, and send a event to PredictedStockQuotes stream. 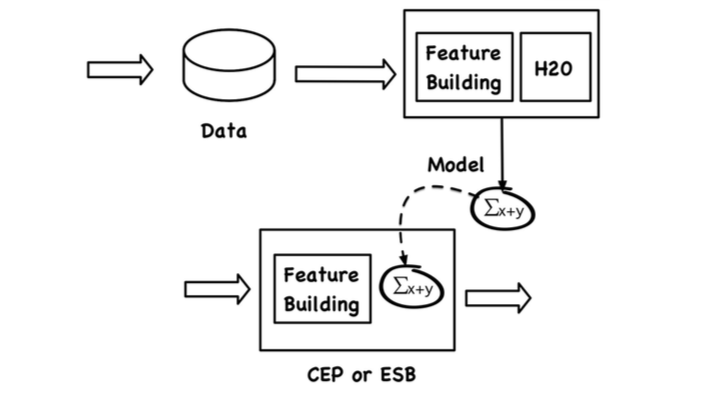 A sample query to evaluate the model using CEP looks like following. Following Figure 11 shows the overall pipeline that includes both training steps as well as evaluation steps. The main objective of predictive maintenance is to predict when equipment failures can occur. Then prevent that failure by taking relevant actions. Predictive Maintenance System (PMS) monitors future failures and will schedule maintenance in advance. Reduces the frequency of maintenance. Minimizes the time spent on a particular equipment being maintained, and allows that time to be productive. Minimizes the cost of maintenance. This article explored different approaches for predictive maintenance using different regression and classification algorithms. Furthermore, the article walked through many techniques for tuning those models. Our final solution predicted the RUL(remaining useful time) prediction with RMSE of 18.77 and predicted failure probability within the next N (30) steps with 94% accuracy. The above techniques need significant amount of training data that include enough failure scenarios. Since failures are rare, data collections can take a long time. This remains a significant obstacle to applying predictive maintenance. Srinath Perera is a scientist, software architect, and a programmer that works on distributed systems. He is a co-founder of Apache Axis2 project, and a member of the Apache Software foundation. He is a co-architect behind WSO2’s Complex Event Processing Engine. Srinath has authored two books about MapReduce and many technical articles. He received his Ph.D. from Indiana University, USA, in 2009. 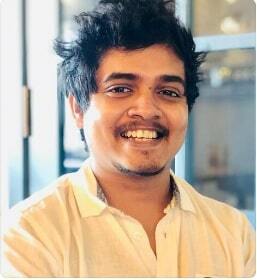 Roshan Alwis is Batch Representative (CSE 13), Department of Computer Science and Engineering, University of Moratuwa. Distribution of Code and Data? Re: Distribution of Code and Data? You wrote in a paragraph above>> "Often, sensor readings have noise. The ReadMe file included with the distribution confirms this. Therefore, we removed noise using autoencoders." What ReadMe file were you referring to? Is there a distribution of code and data that you intended and forgot to include? Sorry for taking time. This refers to the READMe file included with the data set provided by NASA. You wrote "We used H2O Auto-encoder with three hidden layers and the following criteria to remove noise". But where is the configurations about these hidden layers and criteria ? then x is an outlier. Thanks for the excellent article. I have a query in calculating the RUL of the device. As we don't have this variable in train/test datasets, I think we need to calculate this ourselves. Does it make sense to calculate it based on cycle time ? For eg: suppose we have 200 cycle time readings for a device (ie the device fails on the 201st cycle). In that case, at the 1st reading it's RUL is 200, 2nd reading RUL is 199 ..... 200th reading RUL is 0. Is this correct ? Also, if this makes sense, is it logical to include the cycle time as a predictor variable to predict RUL as RUL was calculated purely based on cycle time. Yeah, we have done it in the same way. Thanks for the reply. Appreciate that. Have another couple of queries. 1. Here we have a number of devices(id) in an engine. If any of these devices fails, will it be treated an engine failure ? If not, don't we have model separately for each device(id) ? 2. Not all devices(id) are in all 5 engines. Aren't the engines identical ? Thanks a lot, it's clearer now. I can try this on H2O API. 1) Yeah, we have considered it as an engine failure. Since we have limited contextual knowledge about how engines work, it is somewhat complicated to come up with our own model. 2) According to the readme given in the data set, engines are identical but have different initial wear. Hi, thanks for the great article. I have a question regarding the RUL_FD001 to RUL_FD004 file included in the dataset. If we have to calculate the RUL for the training and testing dataset by ourselves, then what does the data in RUL_FD001 to RUL_FD004 refer to? I am a bit confused because the amount of data in the RUL file is very less compared to the training and testing dataset. Those Remaining Useful Life (RUL) values for the test data. Because we don't have enough evidence to calculate RUL for testing data. So we have to use these RUL_FD001 to RUL_FD004 files. For training, we have to calculate it by our own. I hope I have answered your question. Very good subject. Do we have the code? is it in Python? Yeah, it is in Python. Here is the link to my Github repository. Note: This repository is not well organized for the public use. If you need any further clarification, feel free to ask. Is the code for scikit learn ridge method available? I'm trying with scikit learn ridge method, but the MSE value is very large compared to your result. how to build the fault model,Does it include all sensor signals? About filtering rows , I still can't get the concept , and the running time is huge .. I have used RMSE (Root Mean Squared Error) which means to be the square root of MSE. based on the reconstruction error given by the model, for higher reconstruction error means that the given entry has much more deviation from the original dataset. So we can simply remove some of these records as a threshold. WSO2 CEP, which is used to this demo is now called WSO2 Stram Processor. Scenarios described here works the same. I have a question about the choice between Regression technique or Classification. "The former approach only provides a boolean answer, but can provide greater accuracy with less data. The latter needs more data although it provides more information"
Can you tell how much data is needed to get valuable result with the RUL Regression technique ? KINDLY HELP ME HOW TO USE MACHINE LEARNING TO DEVELOP THE MODEL AND HOW TO USE THE MACHINE LEARNING TOOLS.